For many years I puzzled over the many teachers I'd found whose major works centered on the date 1933, Kahlil Gibran, Alfred O. Korzybski, Samuel Hoffenstein, Brenda Ueland, Dorothea Brande, Werner Heisenberg, Carl Jung, and others. In the introduction to this small book James H. Hindes says, "Eventually Steiner pointed to the year 1933 for the appearance of Christ in the etheric... Humans will become increasingly able to perceive the surrounding world of formative forces." This book is a collection of the notes of students who attended these 12 lectures that Steiner gave in Oslo, Norway from 1901 through 1919. In the lectures he explains the strong images in the Revelations of St John, which he calls the "Apocalypse." 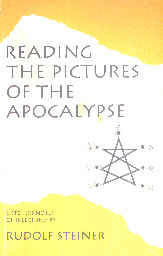 Steiner tells us that the four gospels and the Apocalypse are designed after initiation documents and as such are filled with images that evoke esoteric concepts of the ultimate spiritual nature of man. The fourfold nature of man he finds coded in the four animals of the Apocalypse: bull, lion, eagle, and Man. These represent the physical body, etheric body, astral body, and the I (or soul). 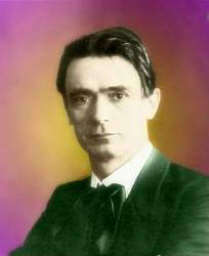 The egalitarian nature of Steiner's philosophy is best illustrated by the following quote, "A final state is pointed to wherein everyone is a priest and a king, a state wherein all distinctions are swept away and all human beings are made equal." Steiner's writings allude to the metaphysical basis of the founding of the United States of America. Steiner directly sees the etheric and astral planes -- which represent the current state of future events. The astral world he likens to a translucent sea of glass. He talks of a time when humans could still see the etheric bodies of higher beings flowing inspiration into earthbound humans, reminiscent of one of William Blake's paintings. Today most people only see the results of such inspiration. Steiner tells us that what plants do for us today, we will one day be able to do for ourselves, that is, take in energy directly from sunlight. Always Steiner sees earlier conditions returning at a higher level-- like a spiral that returns after one cycle to find itself in the same place, only higher. Thus will humans return one day to their oneness with nature, but will do so in complete consciousness.